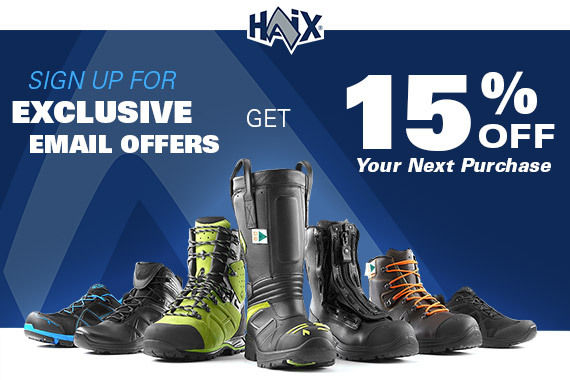 Product information "HAIX Black Eagle Safety 55 Mid Side Zip, FS"
Related links to "HAIX Black Eagle Safety 55 Mid Side Zip, FS"
Our comment on "HAIX Black Eagle Safety 55 Mid Side Zip, FS"
Customer reviews for "HAIX Black Eagle Safety 55 Mid Side Zip, FS"
I love these boots. I wear a women’s size 9.5-10 in a shoe, and the men’s 8 worked just fine. I’m on my third shift in them and they’ve broken in nicely (felt a bit stiff at first). Love the side zip feature-makes it super quick when we get calls in the middle of the night. For as durable as they seem, they’re fairly lightweight. They have good grip and while I wouldn’t mind a bit cooler boot, my feet aren’t drenched when I take them off. I’ve already recommended to my brother who also works HEMS. Excellent boots, very comfortable with minimum break in time. Side zipper works better than other side zip 6” boots I’ve worn on the past too. I'm a gasoline driver, I never thought I'd find better boots than Red wing's and Timberland's, these Haix boots take me to another level of comfort that I never experienced before. The soles, the materials, everything is the best about these boots. I love them. Definitely I'll buy again. Quality, is the best of any boot that I have owned. Only, con is the heel. There, is hardly any give. Even, with gel insoles. But, I still love them.